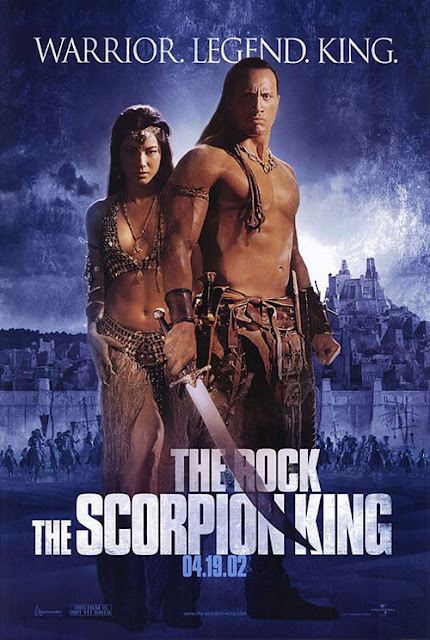 I studiously avoided this prequel to The Mummy Returns on release because I was so repelled by that film’s incompetent CGI monstrosity of the Scorpion King himself. It turns out I did Chuck Russell’s film a small disservice for, whilst it bears originator Stephen Sommers’ smudged knuckle prints in the script department, he is crucially absent behind the camera. The result is an old-school sword-and-sandals picture, with more than a slight doffing of the hat to Conan the Destroyer, that doesn’t outstay its welcome and doesn’t make you feel like you’ve been beaten about the head by ILM (in the interests of fairness, eight effects houses are credited for the disastrous visuals in The Mummy Returns). Russell hasn’t helmed a film in more than a decade; this is his last credit. Perhaps there are personal reasons, or he just hasn’t found anything to tickle his fancy. It’s not as if he was shunned for delivering a string of flops; he has the most respect A Nightmare on Elm Street sequel to his name as well as significant hits in the forms of The Mask and Eraser. Although, picking up on an inferior director’s “inspired” cast-offs does seem a bit like slumming it. Russell’s no auteurist dazzler behind the camera, but he’s a competent pair of hands who knows where to position the camera and how to ensure that action is coherent. He also doesn’t feel obliged to vault through the story at a breakneck pace, drama and tension be damned. He’s everything Stephen Sommers is not, basically, and for that he deserves some small praise. I won’t get carried away, though. This is all relative, and I came upon Scorpion King after enduring TMR. Things don’t look good in the opening scene. The Rock appears wise-cracking (his first line, is “Boo!”) and there’s an inappropriate electric guitar on the soundtrack. But John Debney’s score proves to be agreeable rather than jarring in the long run, while John R Leonetti’s cinematography may not be striking but the plastic sheen of Sommers’ movies is thankfully absent. The plot, as it is (I’m assuming the better elements come from the co-credited Watchmen and X-Men scribe David Hayer), sees Dwayne “The Rock” Johnson’s titular character (at this point a mercenary known as Mathayus) employed to kill nefarious King Memnon’s (Steven Brand) victory-ensuring sorceress Cassandra (Kelly Hu). Inspired name, that. I’ll bet that one came from Sommers. Of course, things don’t go quite as planned. Instead of killing her, he abducts her, and then leads a force against the King. So it’s a bog standard premise, but Russell is blessed with the surprisingly charismatic Johnson as his leading man. His self-conscious delivery actually suits the material, so when you discover he has a pet camel, which he talks to, it’s amusing rather than tiresome. Most of the other performers don’t fare as well, from the obligatory comedy sidekick (The Men Who Stare at Goats helmer and Clooney pal Grant Heslov) to Michael Clark Duncan’s initially-at-loggerheads-but-sure-to-be great friends eventually tribal leader. Bernard Hill bizarrely shows up as a crackpot inventor, while Peter Facinelli (lately banished to Twilight movies) is a conniving turncoat. Most damagingly, the villain is rubbish; Brand has little presence aside from acting like a swaggering prick. Hu, who would memorably clash claws with Wolverine in X2 the following year, doesn’t make an impression for her performance, it must be said. That’s okay, as it doesn’t seem to be why she was cast. Instead, her form is much-adored by the camera as she progresses through a series of skimpy costumes; certainly as scanty as a PG-13 will allow. Obvious CGI is limited, aside from re-use of the series’ crawling critters programme; this time to have Johnson threatened by large red ants. King didn’t make even half the sum of its parent films at the box office, but then it’s in a difficult genre. And, quite possibly, the lack of ADD on the part of its director was off-putting to viewers who expected something that barely made sense. Too slow, no doubt. Or maybe, as seems to have been confirmed subsequently, the Rock just isn’t a major box office draw. I’m making it sound like The Scorpion King is a good film. It isn’t, but it’s a tolerable movie that doesn’t outstay it’s welcome. And you won’t finish watching it feeling as if your retinas have been assaulted. Which is more than you can say for Stephen Sommers-ville.